Do you keep seeing the number 444 everywhere around you lately and want to know more about the significance of 444? Sometimes we see certain numbers everywhere around us throughout the day. But, we're often unaware and ignore these numbers, even though they're a sign that the Universe is sending us messages. If you're seeing the numbers 444 all the time, you should know that this isn't just a coincidence - what you've been seeing is actually an angel number that has a deep meaning and a powerful message attached to it. Now, you're probably wondering what are angel numbers, what do they mean, and why do you repeatedly see them? 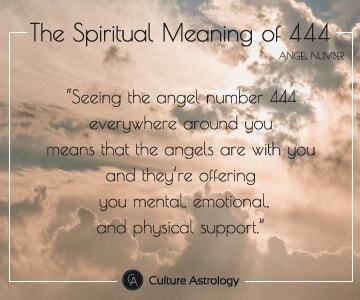 But, before finding out what's the angel number 444 meaning, let's discover the meaning of the number 4. The number 4 derives its meaning from creation. According to the bible, on the fourth day of the creating week, God completed the material universe - the world in which we are born, live, and die. On this day, God brought into existence the Sun, the Moon, and the stars, whose purpose was not only to bring light, but also to separate the day from the night and to mark off the days, years, and seasons on Earth. Number 4 is also associated with the four elements that exist in the world: Earth, Air, Fire, and Water, the four given directions: north, south, east, and west, as well as the four seasons in a year: summer, autumn, spring, and winter. And all of these things have to do with creation. The number 4 brings practical, down-to-earth energy. It's the energy of creating security, safety, and stability as a basis for accomplishing our biggest dreams and desires. The number 4 represents endurance, determination, calmness, and reminds us that we need to put in the effort and work required to achieve our goal. The number 4 is also associated with archangels, and it is an indication that your guardian angels are offering you love, guidance, inner strength, and encouragement to enable you to get the necessary work done. 444 is an angel number, and angel numbers are actually signs from our guardian angels who are trying to communicate with us through numbers. So, if you're seeing specific number sequences over and over again, you should pay close attention because they're angel numbers that contain a hidden message for you. In ancient times, people believed that numbers were carriers of divine energy and that they contain spiritual wisdom that applies to all of us. So, if you're wondering: "why do I keep seeing 444 and what's the angel meaning of 444", continue reading and find out what are your guardian angels trying to communicate with you! Seeing the angel number 444 everywhere around you is a good thing! It means that the angels are with you and they're offering you mental, emotional, and physical support. If you keep seeing the number and you're wondering what's 444 angel meaning, it's important to know that you're on the right path, so trust your journey, listen to your intuition, and don't worry if other people do not agree with your behavior or opinion, because you're being supported. Maybe, you feel a sense of calm and peace when you see this number. This is because of the energy within these numbers that provides divine protection. Whenever you're seeing 444, it means that the angels are trying to tell you that they're here to guide you, support you, give you strength, and help you achieve your dreams. The number 444 also relates to the cycles of change in your life. For instance, an important chapter in your life might be ending, and another one is beginning. So, when you see the angel number 444, you are being given this message: when one door closes, another one opens. The angels are there to remind you that they're there with your through every change and they want you to be open to new possibilities. The number 444 is a powerful sign that you're on the path of spiritual awakening. This angel number is about understanding, so when you see it, it means that something very important in your life has happened and it needs to be understood. The message that this number sends is that you need to be aware that something important has happened or it's about to happen and you need to embrace it. Keep in mind that seeing the number 444 is no coincidence at all - it's a sign from the Universe to help guide you on the right path in life. Why is the time 4:44 so special? Are you seeing 4:44 every time you look at the clock? Don't worry, because this simply means that angels are surrounding you and reassuring you of their love and support. Seeing 4:44 on the clock is a message from the angels who are asking you to consider what you are doing or thinking about at that time. If you were thinking about a particular subject, idea, or person, then seeing these numbers at this particular time may be related. Practicing spirituality and mindfulness can help you to better understand and communicate with angels, so when you see the angel numbers, you'll be better prepared to receive their messages. © CultureAstrology.com 2017. All rights reserved. Culture Astrology is a place for astrology lovers from all around the world who fancy a good read about horoscope and astrology. We provide a thorough insight on each of the 12 zodiac signs and we can help you understand how does horoscope affect your life. Time to connect the dots by connecting with the stars.